I used to own a 1965 signal red TR4a. 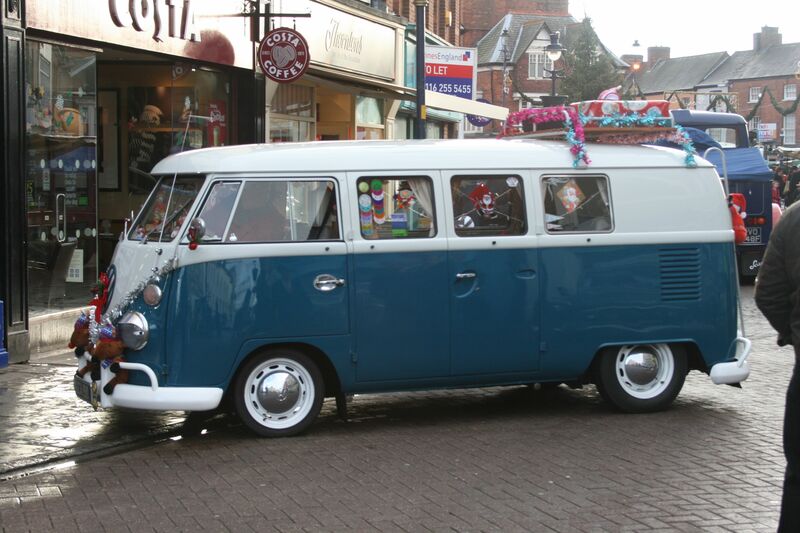 it was very pretty and very reliable but with the onset of children, not very practical without any rear seats! My friend James, already a Stag owner, used to let me keep it in his farm workshop over the winter months and regularly told me that I really needed to buy a Stag. My one disappointment with the TR4a had always been its lack of a throaty roar, so a couple of years ago, I bit the bullet and started searching. I knew what I wanted so I only looked at a couple of cars before seeing an advert for one in the west of Scotland. I managed to tie a visit in with a business trip, and armed with cash from the sale of the TR, did a deal. The next challenge was to get my new Stag home to Kent which was solved when another friend recommended a local transportation company….money well spent! So James and I lined up our Stags in his workshop and tinkered and fettled….as you do, until I looked at his commission plate. Despite his being purchased in Kent, and mine in the West of Scotland, they are only 9 cars apart. With a bit of research, I have discovered that they initially both headed to the West Country as the registration, WG is for Exeter and WV is for Bristol. Not so remarkable you might say until a couple of weeks ago when I was in the process of upgrading my ignition and coil. With the coil out, I was able to read the engine number stamp and made a note of it – LE44741HE. Wondering what James’s engine number was, bearing in mind their close commission numbers, I peered into his engine bay with a torch. I couldn’t believe what I scribbled down – LE44742HE. Two cars sitting next to each other after 38 years with consecutive engine numbers. Why doesn’t that happen in the lottery? So how were these cars built on the production line? Presumably, bodies on one and engines on the other. Were our engines built by the same person? If they were, he did a good job because they’ve both survived this far and have just returned from a 500 mile round trip thrashing down the French autoroutes to Laon. Coincidentally my grandfather , CJ Peyton, was financial director at British Leyland having come across from Rover in the amalgamation. My mum remembers Spen King and Harry Webster who used to come to the house. I remember as a small boy travelling in various “test” models when we visited at weekends including the prototype Range Rover which we took to Holland. My dad discovered a fault on a pre production Dolomite Sprint when he couldn’t release the handbrake after we parked up for lunch and I have a vivid memory of a white Triumph 2.5 PI estate that even then seemed incredibly fast! I was fascinated by the overdrive on top of the gear stick and think of him every time I get my foot down in the Stag and flick the switch! Having owned our stag for fourteen years and also owning a TR5 and TR8 we decided on a sensible day to cut down our car collection so sold the TR8 and the Stag BIG Mistake we wished we had kept them both. However Helene really missed her Stag, funny how every time I turned on her computer it was left on “stags for sale” ? 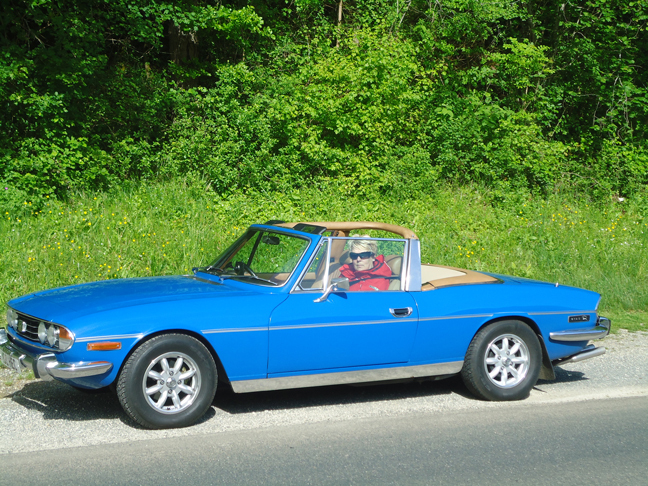 So in 2013 we bought bluebell a Tahiti blue auto Stag. I am no mechanic but we like everything as it should be and tinker so all the lights work, doors click etc. The only major thing we had done was a Tate and Lewis gear box, not cheap but wow it transforms the car to a wonderful long distance cruiser. Always staying our first night in St Omer to get the feeling of France we travelled through the centre of France taking the scenic routes down to Orleans on to the Dordogne and Sarlat for the Saturday market. Then on to Carrcasonne we crossed into Spain for for a night in Viella travelling along the Spanish Pyrenees, seemingly all to ourselves the roads were smooth and completely empty. 2CVs may be small but boy they can make a lot of noise, Also by chance the Red Bull cliff diving challenge was in town diving off one of the harbour towers, the place was very much alive. Then onto Dinan, Port Bessin, Honfleur and then home. Now for the most important bit. The only problem was we took several CDs to play but only listened to the wonderful sound of the Stag. Thank you John & Helene Dennison for sharing your wonderful trip with us all!! My Stag History – A Proper Bird Puller!! 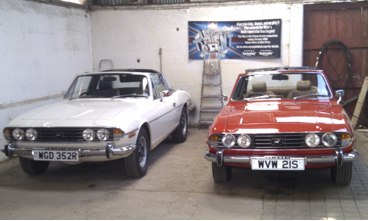 I bought my 1972 Triumph Stag in April 1983; the first MoT I obtained in July 83’ shows a genuine 32,370 miles. I bought it from a work colleague who in turn had bought the car about two years earlier as an investment, only to find that the Stag was fast becoming unloved by the public. He used it for around six months and then garaged it until finally coming to the conclusion that it must be moved on. I took it for a long test drive noting that the engine was rattling, the hood torn and faded, the exhausts rusted through and then…. ran out of petrol! However, it was a car I had loved from the day I saw Tony Soper driving one through the Scottish Highlands on one of his TV wildlife programs of the early seventies. Seeing one in the flesh and hearing the wonderfully laid back V8 burble only reinforced my desire to own one and so none of this put me off the purchase; my mind had been made up years ago. I replaced the timing chains, exhaust (the stainless steel replacement is still on the car) and hood (subsequently writing up the hood replacement in 1985, for issue 66 of the SOC magazine) and had the paint refreshed by a local spray shop in Belper, Derbyshire. I also stripped off all the underseal and repainted the underside and wheel arch recesses with bitumen type paint, followed by waxoyl. Six months later I had the automatic box rebuilt by a Borg Warner specialist after the clutch plates started slipping. For the next two years the car ran very well, but I had noticed that the oil pressure was low, almost non-existent on tick over. In 1986 I had the luxury of a Nissen hut for a garage and so I removed the engine and rebuilt the bottom end, replacing the crankshaft with a Tuftrided version. After this the car ran until 2000 when, at 104,000 miles and over a two year period, I carried out a top end rebuild as one of the heads started to blow and so it was an ideal time to have hardened valve seats inserted in order to run on unleaded fuel. I also had the automatic gearbox rebuilt again, as it was always leaking fluid. 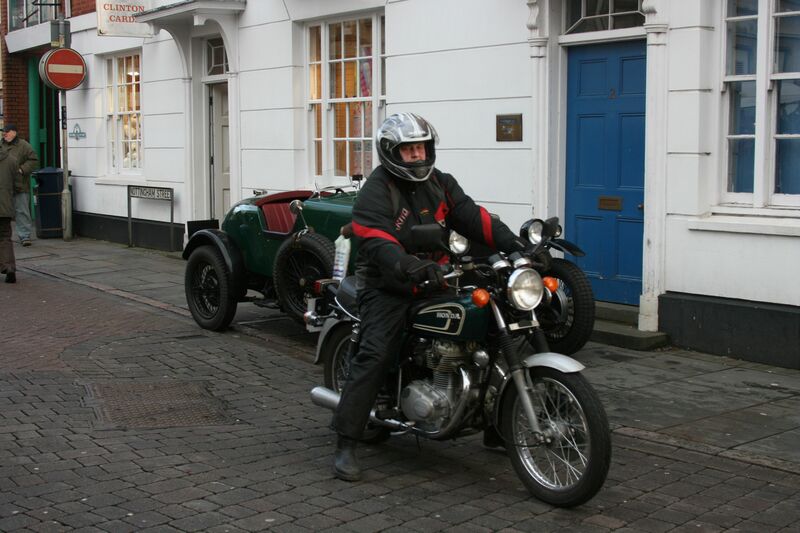 In 2004/5 I had a back to bare metal re-spray after overhearing a conversation between two motorcyclists waiting behind me at a set of traffic lights in Bath. “Great car” one said to the other. “Yes, but s*** paintwork” replied his mate! Having attended to the exterior, I turned to the interior and re-veneered the instrument panels with burr walnut (recycled from my neighbour’s wardrobe doors) and fitted new wool carpets. The original front seats were replaced with black leather SAAB 93 seats, matching perfectly with the dash and centre consol which I had re-covered in black leather. I also treated myself to a set of Minilite replica wheels taking the wheels up to 15inch diameter. Having run without a hood since 1996, I finally had the hood frame shot blasted and powder coated before re-assembling (with thanks to Colin Brookes for letting me use his car as a reference) and fitting a new mohair hood in 2014. The next major job will be to rebuild the hardtop which is badly rusted. Between 1983 and 2000, I ran the car almost as a daily driver. However, winter would generally tend to see less frequent use and, after 1994 I began to use the car only at weekends and in fine weather, so annual mileage dropped to between 2k to 3k. Since the re-spray I have been very protective of the car and annual mileage is down to between 200 and 1000 miles. Over what is approaching thirty two years of ownership I have amassed many wonderful memories of spirited driving throughout the West Country and the Midlands. The photograph below was taken around 1987 and shows a nephew and niece in the car at Burrator Reservoir, S.Devon. In June 2014 we re-created this photograph showing the four of us in our current guise; I am the only one who seems to look worse for the passing years! 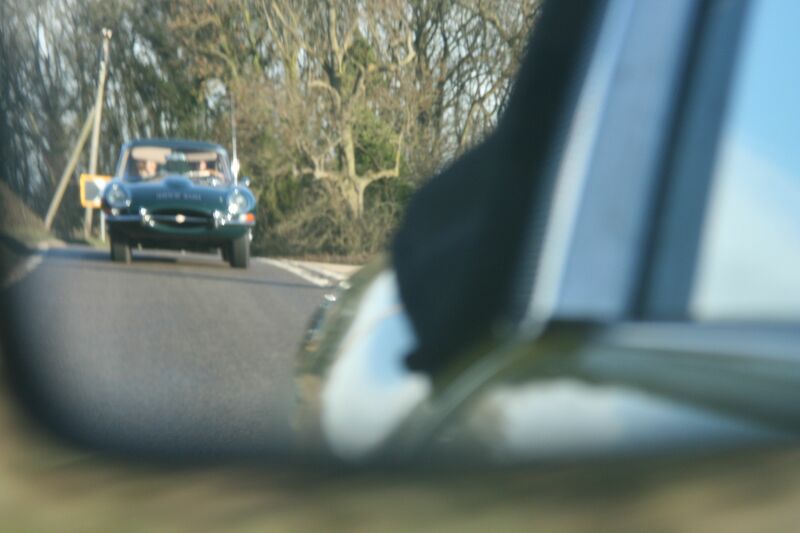 Throughout its time with me, the car has been a genuine ‘bird puller’, often used to transport my birds of prey. As from the late 90s onwards saw the car used without a hood or roof, the birds were on open display, either on a perch bolted in place of the front passenger seat, or on a cadge secured in the rear seat well. One of my peregrines used to particularly enjoy the ride; perched on the cadge in the rear, as I increased my speed she would stretch out her wings and, without any wing beats, ride the air currents. However, after several years I decided I should stop this after the driver and passenger of a car travelling alongside us on a busy dual carriageway were so distracted by the sight of the peregrine that they collided with the car in front. The Stag is very popular with my nephew and nieces and has been used as transport to a school prom’ and a wedding car. Providing the weather is good, it is ideal as the couple can sit on the hood stowage cover and hold on to the ‘T’ bar as I drive the last few hundred meters. I don’t visualise selling the car and with luck I might still be around in twenty seven years time and we can then recreate these photographs, however, I will probably be the passenger rather than the driver. Thanks to Donald Peach for his story and wonderful pictures in this article. One of our members sent in some wonderful pictures of his envious visit to the JB stag before it left for its new home in the US. Here’s Johns account of his day, Thanks John!!! I tried to get the owner to pull the Stag out so I could get a picture of it beside mine but he would not, I even tried to buy it but he said I could only have it if I bought the other cars as well!!! The Stag was standing next to the White Toyota used in “You Only Live Twice” of which only two convertible versions were ever made by Toyota, both for the film. So the beautiful Stag was of course the star of the show in Diamonds are Forever with the best JB – Sean Connery!! Can you name all the other movies from the montage above???? With Christmas nearly upon us we all gathered at the Flying Childers in Kirby Bellars for one final show at the Melton Mowbray Xmas market at 10am on a sunny but chilly December morning. 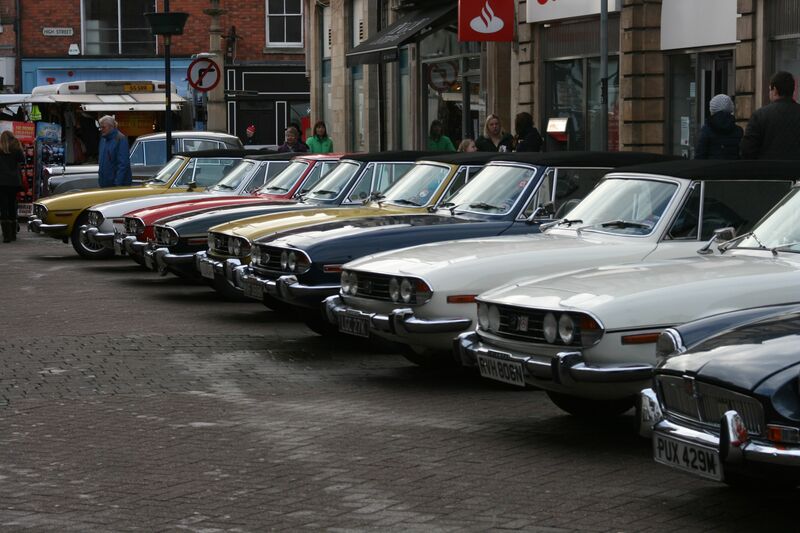 With 6 Stags in convey in to the middle of Melton, with a sudden right followed by a left at the top of the pedestrian way we are beautifully parked outside the famous ye olde pork pie shoppe. There we some lovely cars on display, immediately next to us was a pair old english white MG’s, Soft top beetle and a very well maintained Alfa Romeo. 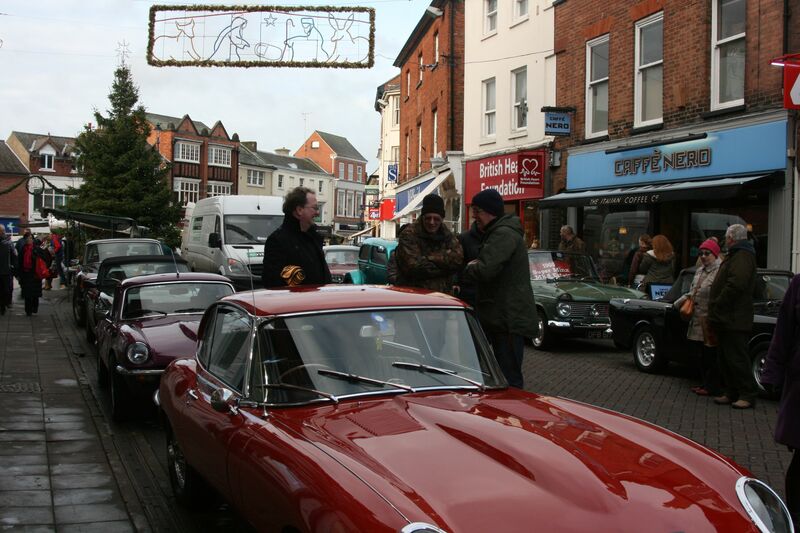 As the day progressed an ever growing collection of vehicles began to gather around the pedestrian area including the very clean and shiny Diamler and it’s wire wheels, to the vibrant purple GT6 sat behind the pristine looking E-Type Jaguar. 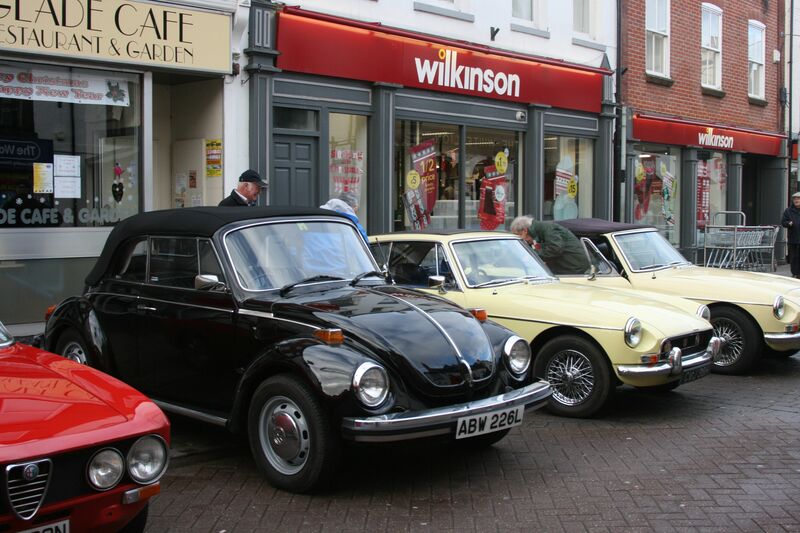 It wasn’t just classic cars that were there, we had several really classic cars on show that were braving the chilly weather and a few very, very brave motorcyclists that had ventured in to the middle of Melton. Of all the beautiful cars and bikes that were on show this split screen VW was dressed in tinsel, lights and general christmas decorations and made everyone smile as they walked past this very cheery van. All in all this was a small event that started at the beginning of the day that gradually swelled with cars as the day progressed, thankfully the promised rain and bad weather did not materialise and about 50 cars and bikes were on show for the local shoppers. 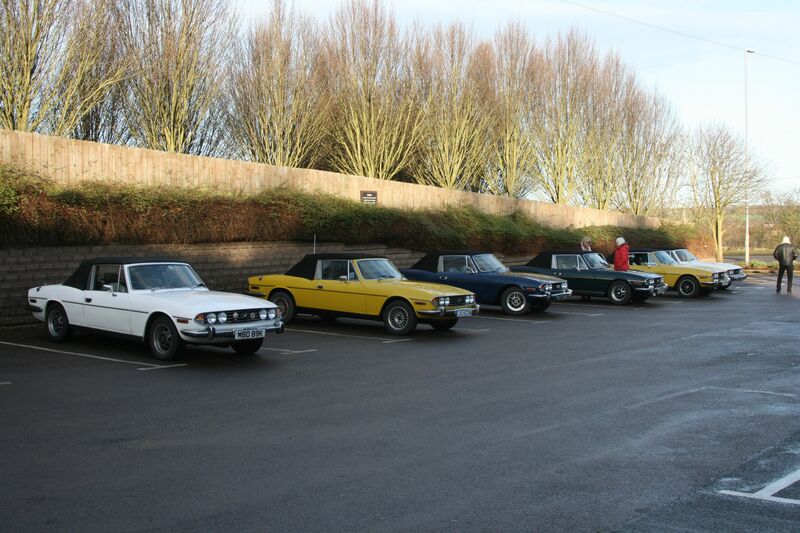 We love to hear about our members and fellow Stag owners stories of ownership and what they have been up to with their pride and Joy. Here is a great story from Andrew….. When I bought my car in early 2007 it came with quite a large history file going back to 1989 including receipts for huge amounts of restoration work, mots, tax discs etc but no Heritage Certificate which I sent for within a few weeks of buying the car. Surprisingly all the numbers still matched including all the keys but it also showed the car no longer had it’s original registration number. But as my 2000 estate had lost it’s number at 3 years old due to having a private plate fitted I wasn’t really bothered. However, unlike the 2000, the certificate did show the original number of KCK42N. This must have been in the back of my mind as to why this happened. Had the car been written off? Did someone want to keep the original number? By 2011 whatever the reason I decided I wanted to know and contacted DVLA who advised me to fill in form V888 which I did and sent it off with the £5 fee. The information which was copies of all the previous owners documents arrived a couple of days after the Norfolk National and I found the 1986 -1989 owner, Mark Balfour had lived about ½ mile from the hotel we were staying at. Had the information arrived a week earlier I would have gone and knocked on the door to see if he still lived there. It also explained the change of number. In 1978 the car was bought by a Henry Travis who had the number HST 99 fitted to the car and at this time the original number was lost. When he sold the car it was issued with it’s current JTA608N. The car was supplied new by Hebden Bros, Springs Garage, Todmorden and was supplied to F&T Lumb Ltd of Hebden Bridge and over the next 11 years it had another 10 owners, one for 4 days so presumably a dealer and was twice sold without documents. It also moved around quite a bit, going from Yorkshire to Lancashire, Devon, Hampshire, Herefordshire, Gloucestershire, Wiltshire, Norfolk and back to Yorkshire before I brought it to Derbyshire. Having worked in Todmorden at one time and knowing the area quite well, when I was told there was a good Vintage Weekend in Hebden Bridge it seemed like a good idea, so form filled in, a room booked in a local pub and we were all set for the weekend. Knowing that if owners put something on their car telling it’s story people do tend to read it so I decided to put a note on the car along with the usual information asking for information about the supplying garage and F &T Lumb. I didn’t really expect to find out much but was hoping it might turn up a dealer sticker, a key fob or possibly someone who knew of the original owner and possibly remembered the car. We hadn’t been there that long and we had had a walk round when a man, whose name I didn’t get came and told me he had probably done the pre delivery inspection on the car as he worked at the garage during the ‘70s and although they were a multiple BL dealer he did mostly Triumphs. He told me the garage is still there but has been redeveloped and is a filling station. The next person introduced himself as Derek Carlton Crabtree who told me F&T Lumb were egg producers and poultry farmers and suggested I went to the visitors gate and ask for Derek Sutcliffe as he was part of the family and he may be able to help. It turned out it was his car, he had it new as a company car. He had seen me drive in but obviously didn’t recognise the number so thought no more of it so was quite shocked when I told him the story. We also met Stephen Barker, a friend of Derek’s who was at the show with a Ford GT40 replica who also remembered the car well. As this is a Rotary Club event and Derek is involved with the weekend we had our photos taken for their newsletter and a photo also appeared in the Hebden Bridge Times which Derek very kindly sent me along with a couple of photos taken while he owned the car. He had the car for 3 years and during that time it had the head gaskets replaced twice after overheating near Keighley and then Penrith. It overheated again in Bristol when Derek’s brother had borrowed it, which apparently took some time to repair as British Leyland were on strike and there were no parts for it. In March 1978 the car was sold and went to a dealer friend of Derek’s, Geoff Gladsbrook at Hawksclough, Mytholmroyd who used the car for a while until he also encountered overheating problems and sold the car on, presumably to another dealer in Blackburn called Charles Pavelyn as this is the second name the car was registered in. 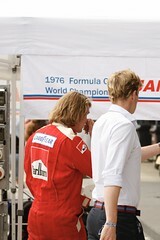 In April 1978 the car was sold to Henry Travis who transferred the private number on to the car. All in all this was a very good weekend and I think 2 of us had our day made. We were asked to go back next year which we will as it is such a good weekend. 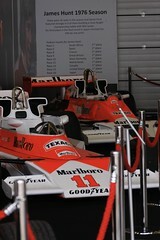 Due to the number of exhibits we were there on Saturday, Sunday being for pre 1971.